Poor Badger Creations: Fabric manipulation: How to make beautiful fabric flowers. Fabric manipulation: How to make beautiful fabric flowers. This year I decided I was going to really test my sewing skills and attempt to make mine, my 3 year olds (Miss Olivia), and my 4 month olds (Miss Abigail)Easter dress. For some of you awesome, crafty mommys this is no biggie. I can sew some, but I am still a bit unsure. So I sketched and wanted to make a skirt of roses for the girls and add a few of those roses in my dress. So here is my tutorial on my method of creating roses. 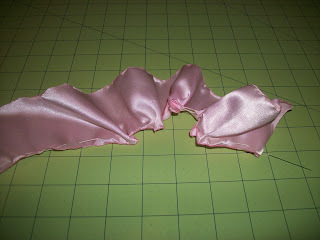 I am using a pink silk, but this can be done with organza, silk blends, or cotton fabric. The dresses are still under construction, but I will do a follow up so you can see the finished product. Another tip: when cutting with a rotary cutter and a ruler. Lift up the strip of fabric BEFORE you lift up the ruler. That way if a piece is still attached it will be easier to lay the fabric back done then try and get the ruler in the same spot. Silk FRAYS! This poor hairy piece was only laying on my sewing table for half an hour and it got this hairy. Use your scissors and give it a quick hair cut before moving on to the next step. Don't skip this step even if your piece only grew a few hairs, you'll be glad you didn't skip it! After the hair cut, use a light or one of these handy dandy camp lighters to scorch the edges. This has two purposes. The first is to prevent future fraying and the second is to give it texture. I fully recommend doing all sides. This is what it should look like after scorching. It gives the ends a delicate look of a petal and makes the silk naturally curl. Now you are going to get your thread (all purpose thread) and needle and run a basting stitch along the bottom. This is a simple in and out at about 1/2 inch apart. 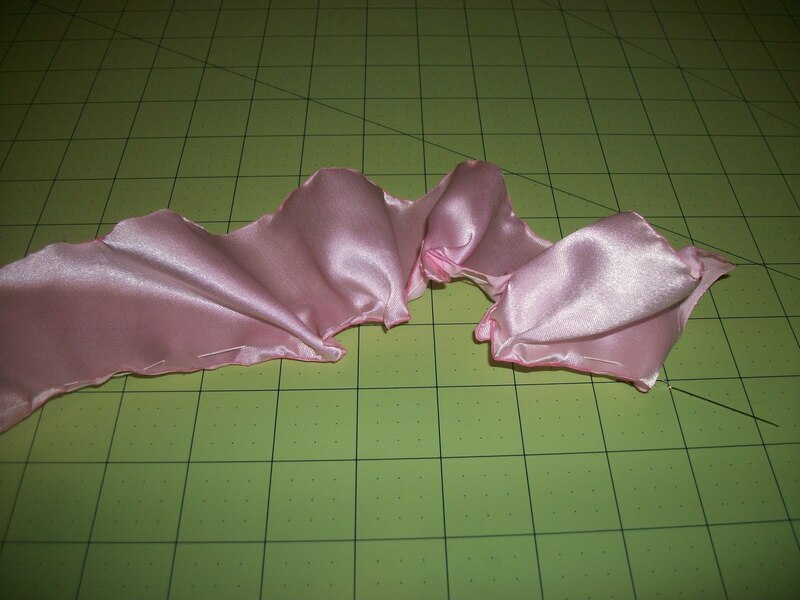 Just make sure your thread doesn't get tangled, you'll need the thread to easily glide through the silk/fabric. Run your stitch the entire length of your strip. Once you ran your basting stitch the whole length, you are going to lightly pull the thread so that the fabric bunched up. Kinda like pulling the string on shorts to tighten the waist. This is what it will look like after you pulled the thread. Now find the two ends and match them up. Now take the needle and thread (at this point you haven't clipped the thread yet) and run it through the bottom or bud to secure it and tie it up with a knot. And there you go! A pretty silk rose. As for me...50 done and 100 to go! You can do so much with these roses. Thats why I wanted to post a blog on them. You can make one and glue it to a gator clip for a cute hair accessory, hand stitch one or more to a garment, or stitch or glue them to anything except the cat! Thanks for taking the time to read another fun craft project. I'll do an update once the girls dresses are done. I love all the fun crafting friends I've made on this fun adventure and I hope I inspire others to try and live the home made life. 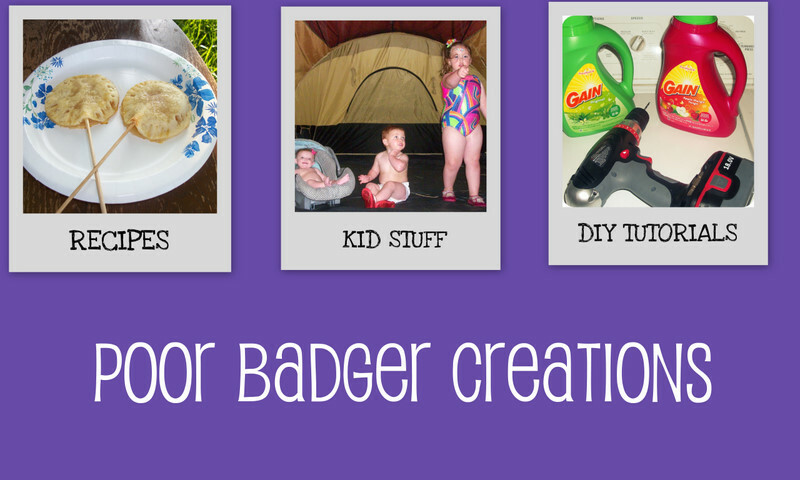 Check out more stuff from Poor Badger on our faceebook page. Happy crafting!